My lion roar is going forth throughout the land. 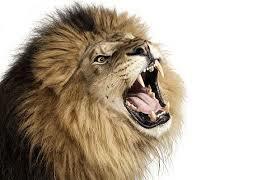 I am the Lion of the tribe of Judah. Praise and my roar go together. As I roar, fire goes forth from my mouth consuming my enemies. My refining fire crackles and consumes the dross. My bride will come to me unencumbered, by the enemy. Spring is the time, when kings go to war. I am going to war on your behalf, my beautiful bride. At my roar, your enemies flee. I am King of Kings and all will bow the knee to me. Rest assured my bride, you have nothing to fear. I go before you and consume all of your enemies. Those that you feared yesterday are no longer a threat. Rejoice, in the Lion of the tribe of Judah. I am your God and Redeemer. Bow your knee and let my joy consume you. Dwell in the place where the lion and lamb dwell together in safety. Rejoice in my roar! « Jesus Died For You!